When I came back from Shimoda downtown I found out this scene this late afternoon. I parked my car on the road and took this picture. The moon has just rose up and the moon light was coming down on the sea. 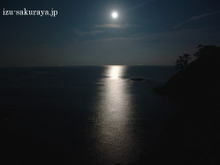 This entry was posted in nature on 2009年10月4日 by izusakuraya. 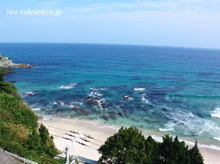 It was sunny in Shimoda today. When I was cleaning in the building it was very hot and broke out the sweat on my forehead. When I went out for shopping I took this picture near the beach. The water was blue and clear. I wanted to swim today if I didn’t have to work. This entry was posted in Family on 2009年10月4日 by izusakuraya.